Tell us about your new gallery/store and what things we can expect to discover. 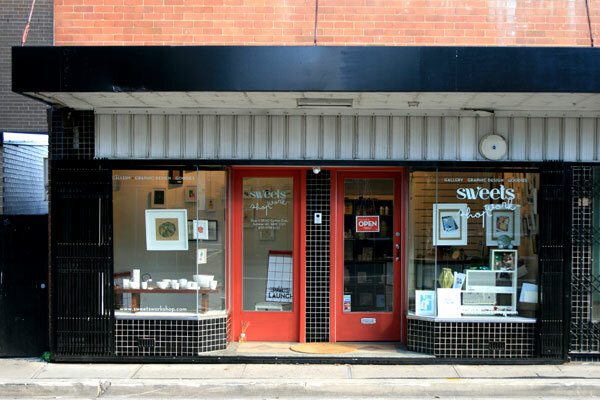 Sweets Workshop is a new retail art gallery which exhibits and stocks art, decorative objects, giftware and independent publications with a strong focus on locally handmade items. As designers, our dream was quite simple, to have a space that allowed us the freedom to be creative while offering something original, sweet and within reach – every time you visit. 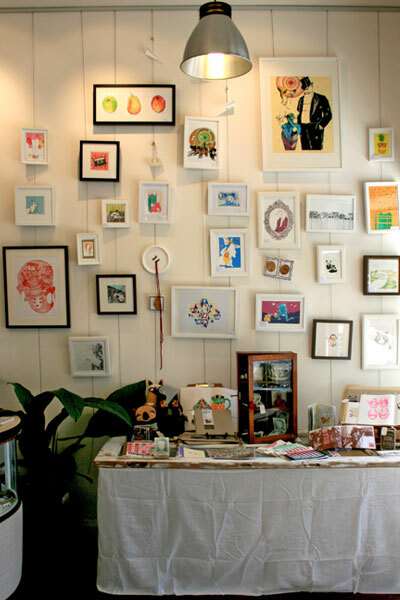 Sweets Workshop has a dedicated exhibition space, which can feature one particular artist/designer, object, artistic process or theme at a time. The exhibitions change regularly to incorporate as many artists and designers as possible. 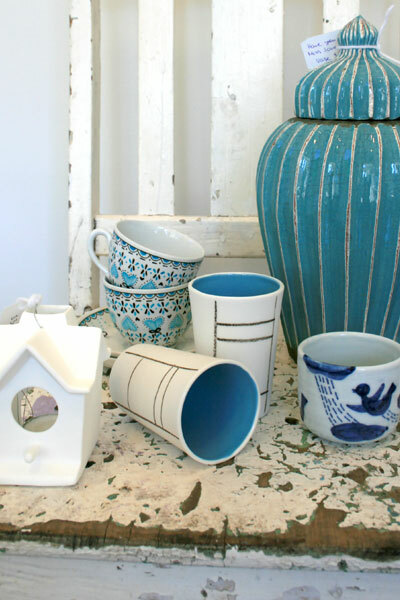 Our shop is located in the inner-western Sydney suburb of Summer Hill, a community very proud of its unique village style of living. We are shop 4 of the Penalt Building, a beautiful and historically significant retail/residential art deco building. Sweets Workshop opened its doors on the 17th of July 2010. Although we had many a weekend breakfast dreaming about the idea of having our very own shop and gallery, it wasn’t until we took a long needed holiday that we realised how much we wanted to make it happen. The idea of having a space that allowed us to be creative and fill with the things we love, while supporting fellow artists and designers really appealed to us. We saw the space the day after we returned from holidays and fell in love with the art deco building, built in 1939; the possibilities felt endless. There were quite a few hurdles to get through, piles of paperwork to sort out and a lot of elbow grease needed (it’s all documented on our website) but here we are eight months later, and we’re open. What labels & products do you stock and what are you searching for? 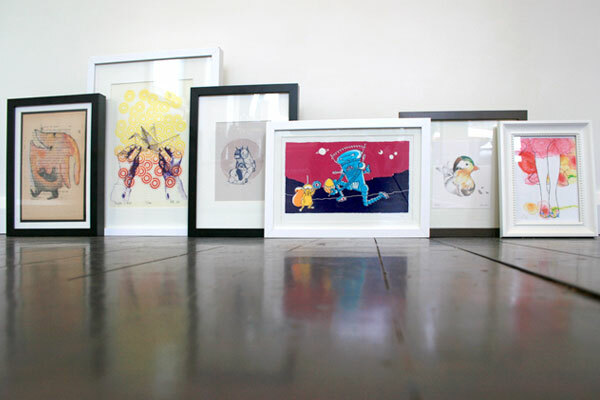 Our retail art collection consists of originals, limited edition and open edition paintings, drawings, prints, digital and collage works created through various traditional and modern techniques. The Decorative Objects and giftware, which we stock, include eating and drinking vessels, vases, votives, decorations and other curios. 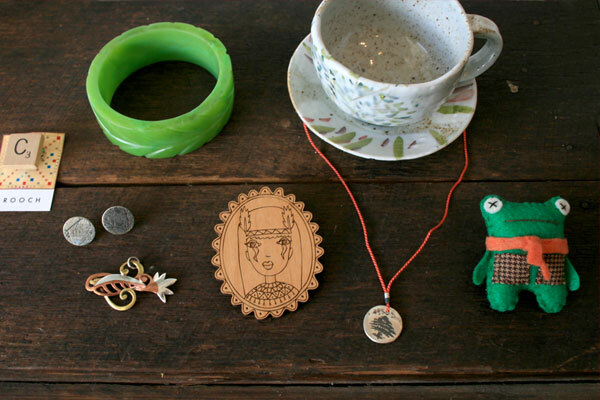 We have a wide variety of handmade jewellery including pendants, earrings, bangles, brooches, badges and cufflinks. These are made from silver, brass, cooper and other precious metals, recycled silver, resin, wood, wool and thread. 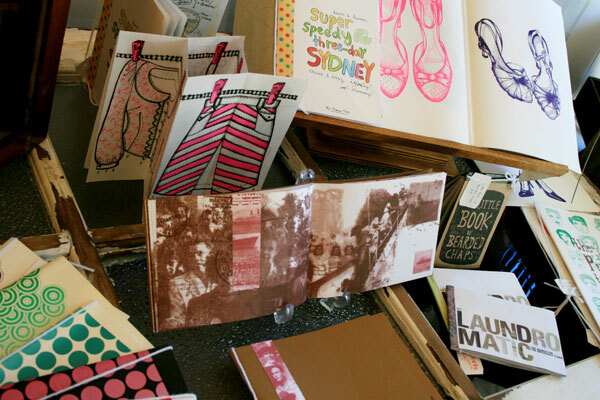 With both of us coming from a publication-based background, Sweets Workshop has a soft spot for zines and other short run, self-published art and design publications. While searching for new contributors we really enjoy hearing about the story behind their work. We are always on the look out for an artist or designer who has a point of difference. We thoroughly appreciate and value the time, effort and love which goes into the creation of the hand-made pieces which we keep. At the moment we have stock and exhibits from the following artists: Emmajane Illustration (Emma Simmons), John D-C (John Debono-Cullen), Anney B. (Anney Bounpraseuth), Benconservato (Emma Kidd), Clay Australia (Kim Long), Have you met Miss Jones (Jennifer Jones), Herbert and Friends (Torunn Higgins), Little Slave (Amanda Nakalevu), Mixtape, Ghostpatrol, Anais Taylor, David Eris Loong, Dawn Tan, Genna Campton, Kate Banazi, Katie Muth, Kylie Gartside, Mechelle B. (Mechelle Bounpraseuth). What do you feel makes your store unique? As both a shop and gallery the space is ever changing and evolving, it is a space people feel comfortable to come into and spend time browsing. We provide pieces that fit with our customers’ lives – they’re ready to brighten up a wall or an outfit and are a practical size for small spaces while being affordable. One of the things we really enjoy is searching for new talent; it’s exciting to have a space that allows you to build relationships and support artists and designers while giving them a venue to display their creations to the community. As a gallery space our collaborative exhibitions built around an artistic process or theme help to nurture new artists and designers by giving them the opportunity to be a part of an exhibition. Our space also offers established artists and designers an alternative outlet for their creativity to connect with a new audience. In keeping with our aim to offer art that is within reach, our exhibitions also feature the thoughts and processes that go into the production of the work, something that sets us apart from most traditional art galleries. We feel this insight and peek behind the scenes helps create a connection between the artist and viewer, bringing people closer to the artistic piece. Most exhibitions will also be short and sharp, so there will always be something new when you visit. What advice would you give to others setting up shop? “Hold your breath and jump in”. After our spontaneous decision, we then developed a sound plan and strategy to get to where we are now. Research can be fun when it’s yours and it’s something about which you are passionate. Get to know the suburb in which you are setting up, find your point of difference and sing it. Work on building a relationship with your community. Document everything, people love the journey and it helps to acknowledge your achievements however small, in the end all of the hard work is worth it. Finally, no matter how long your list of things to do is, remember to always set aside time for yourself and your loved ones. What are your plans for the next twelve months for Sweets Workshop? We are planning to have our online shop set up very soon, so if you can’t make up your mind in the store, then you have that second chance online. We are also launching our Sweets Workshop stationery brand, which will include stationery sets, wrapping paper and card designs. The range will evolve and grow throughout the year with new designs and products. There are some community events that we will be contributing to in the near future. We are also releasing our own publication and exhibition to support one of these events. As graphic designers and illustrators we’ll be offering these services from the shop. Sweets Workshop will continue to search for interesting new talent to present in our exhibition space and wonderful new products for our retail space. WOW! Great deco building for a great shop and gallery. I am heading to the hills.